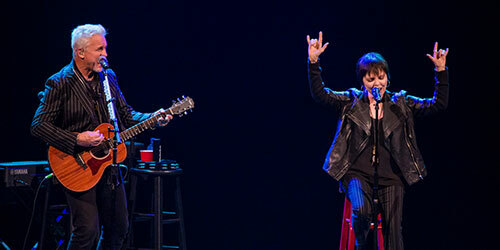 Married duo Pat Benatar and Neil Giraldo (Spyder) performed their songs acoustically at The State March 5th and it was a treat! They have been playing music together since 1979 and have been married since 1982. Neil produces and writes and Pat is the main singer. Neil mentioned they wanted the show to be as if they stepped into a living room to perform, and that’s exactly what it felt like, complete with a Persian rug. Pat still wears her black hair short, but her trademark black spandex pants have disappeared. I guess some things change. What has remained is their music which rocked the radio waves during the 1980s; hearing it performed acoustically was sweet. The living room feeling wasn’t just for appearances; I found the duo to be honest and comfortable. Pat said that when they first started performing together they were young, in their 20s, and singing about their personal lives was not something they felt comfortable doing, so they sang about people outside themselves. That all changed with “Promises in the Dark,” which was their first song about them. Their music is fired up, with a large dose of reality, and now seeing the couple live, I now know why—they aren’t afraid to show the world who they are and, as a result, the reward is raw emotion packed with good old Rock n' Roll. The night included most of their 14 greatest hits, a reference to the chatter which ensues if they don’t perform the songs their fans expect to hear at live shows. Favorite songs of the night for me included “Hit Me With Your Best Shot,” “Heartbreaker,” and the new hit “Shine,” dedicated to the women of the world. Neil said the lyric and melody, along with the instruments and music are the necessary elements for a song to take off and gain ground. Although he only had a guitar and piano, he also incorporated a recording with other instruments which rounded out each song, making it a fantastic show. Whistlers filled the State Theatre begging for an encore which included “Ring of Fire,” a pleasant surprise. This dynamic duo seems unstoppable, so we can expect them to continue their musical legacy. Their fans are devoted, so Pat and Neil can expect a crowd every time they perform live.